Our customers often tell us that they leave how easy-to-use the ZENSIE platform is. But whether it’s getting the hang of a new feature, onboarding a new team member or your run of the mill troubleshooting, everyone needs a little help sometimes. 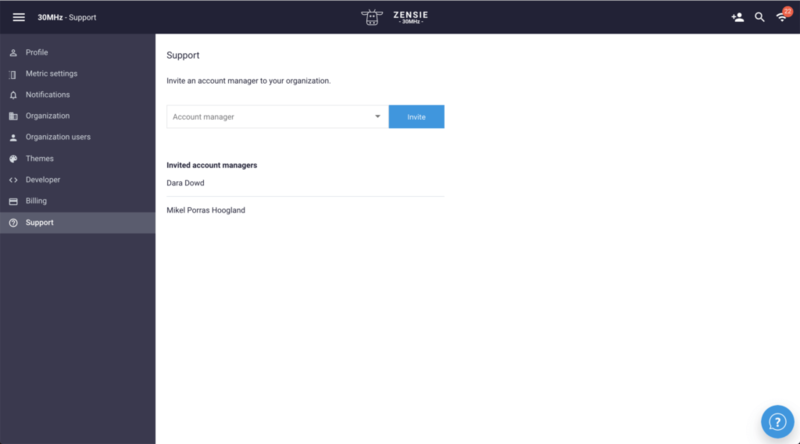 We’ve made some changes to the ZENSIE platform to make getting support easier for our customers. Whether it’s via email, a message on our website or through social media, there’s plenty of ways to reach us. It’s most likely that your account manager will be there to respond straight away, but if they’re not available, another 30MHz team member will be on the case. Whoever it is that’s helping you out will more than likely need access to your dashboard to provide meaningful support– access you’re able to give them. and finally, via the drop down menu, you can select an account manager and click on the blue ‘invite’ button. Add the email address of the 30MHz team member who’s working with you, and grant them permission to view your dashboard. Don’t worry, you can revoke that permission at any time. It’s up to you. You can do this by hovering over the specific account manager and click on the red cross that appears. The 30MHz Gateway is the device that gets the data from the sensors and sends them to the cloud. The 30MHz Gateway needs to be connected to a power supply (wall socket) and it should also be connected to the internet, via ethernet (cable) connection. This is the advised and most preferred way of internet connection (in some cases, we can support wifi connection or a 3G mobile network. For more information contact us). A DHCP server is needed to hand out a IP address to the Gateway (we can set a static IP address, but this needs to be pre-configured). 123 UDP – For NTP time synchronisation. 53 UDP – For DNS name resolution. Each of these should work with outward only (and inward once outward connection established) firewall settings. 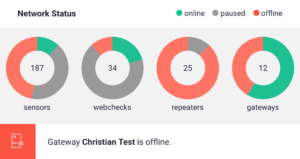 Optionally, you can make an outgoing connection to mixpanel.com. This is not a functional requirement, but it allows us to track some useful metrics. Is the 30MHz Gateway plugged to the power socket? Hint: to reset the Gateway, you can unplug and reconnect it to power. Check the WiFi connection details (eg. correct password). If you use 3G connection, there might be troubles with the SIM card settings. In this case, contact us.